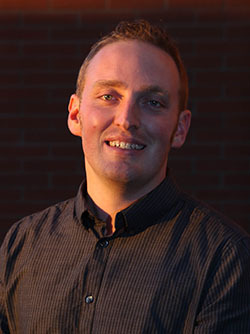 Barry Regan, director of GCU’s Speech and Debate Team, is excited about the team’s No. 17 ranking. For the second year in a row, Grand Canyon University’s Speech and Debate Team has cracked the top 20 out of 152 teams in parliamentary debate rankings. The National Parliamentary Debate Association listed GCU at No. 17 after calculating points from the season’s start in mid-September to the end of January. The team also made the top 20 last year after earning a No. 15 spot in January 2016. The current ranking was tabulated before the team’s wins earlier this month at San Diego State and Point Loma Nazarene universities. “Once that is added, we will probably move in to the top 15,” said team director Barry Regan, a College of Humanities and Social Sciences instructor. GCU uses a debate style typically practiced by schools in the West. Larger universities with abundant resources often compete in “policy debate,” which centers on one topic each season, Regan said. Such schools can deploy graduate students to exhaustively research the topics. 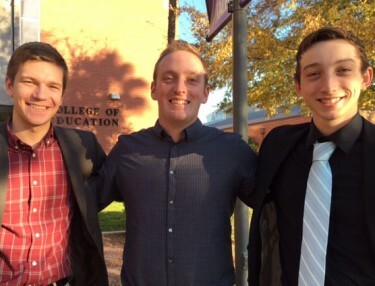 Regan, center, with Thomas Rotering, left, and Zach Kuykendall, two of the GCU’s top parliamentary debaters. Parliamentary debate features a different topic every round, a more egalitarian approach in that teams can prepare without additional resources, he said. In the San Diego State University contest two weeks ago, GCU took first place out of 17 teams, including several that perennially rank in the Top 10 nationally. At the Point Loma tournament the same weekend, the parliamentary debate partnership of senior Thomas Rotering and sophomore Jasmin Richardson upset the No. 1-ranked partnership in the country, the University of the Pacific’s Dallas Phillips and Paul Villa, in the “Sweet 16” round, Regan said. The last regular-season tournament is Sunday, Feb. 26-Tuesday, Feb. 28 at Hastings (Neb.) College. For the first time, GCU will host the national Christian College Forensics Invitational tournament, scheduled for March 17-19. Kuykendall and Alandzes had a stellar performance at the California State University Long Beach tournament and moved to No. 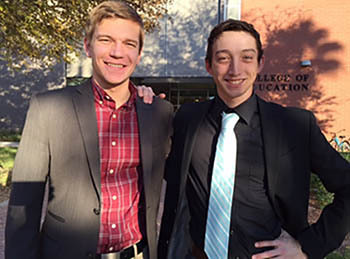 29 out of 448 ranked partnerships, giving GCU two Top 30 debate pairs for the first time in team history. At the Mile High Swing invitational at the University of Utah, Rotering and Sharp reached the “Sweet Sixteen,” which placed them 23rd in the nation out of 392 teams.